Today's image is a 1950s postcard from Brea. Probably the best place to find old postcards (locally) is Hal Lutsky's Vintage Paper Fair. This event will return to the Glendale Civic Auditorium, 1401 N. Verdugo Rd, in Glendale on May 31 and June 1. The Old Towne Preservation Association (OTPA) in Orange will hold their next meeting tomorrow, May 21, 7pm, at the Orange Public Library, 407 E. Chapman, in Orange. The topic is, "How Our New Main Library Archives & Preservation Online Can Help You." I understand the history room at Orange Public a good collection and staff. But as long as their archives charge an $85-per-photo use fee, their helpfulness will remain somewhat limited. The OTPA is also looking to fill positions on their board for 2009. If you're interested, call them at (714) 639-6840. The Santa Ana Historic Preservation Society recently posted back issues of their newsletter (1989-2008) to their website. Chris, do you attend all of these events that you frequently mention on your web site? You must spend a ton on gas. I sure wouldn't want to drive all around Southern California in this day and age. I don't have enough time to attend ALL these events. But I try to attend as many of the interesting ones as possible. I announce every relevant I hear about, in the hope that readers will make up their own minds about which ones to attend. Expensive gas is just the cost of doing business right now. As a Southern Californian, I have only two choices: Drive, or become a hermit. Well, if you become a hermit you'll always have a lot of history around you that you've collected over the years. 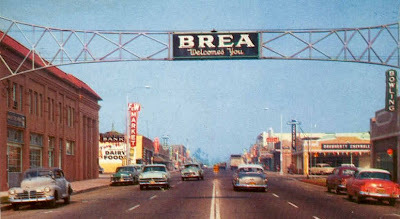 Regarding the photo, I didn't know that Brea was around in the 1950s. It always seemed to me that it didn't spring up until the 1960s, when neighboring communities to the north, such as Diamond Bar and Rowland Heights, began to be developed. Brea began as a little oil town, around 1911. It incorporated as a city in 1917.